Snack brand launches hidden camera video to raise awareness that the Gender Pay Gap is Nuts! PITTSBURGH & CHICAGO--(BUSINESS WIRE)--NUT-rition is a brand that believes women should demand more…more from their snacks and more from their lives. But women today face bigger issues than finding the right snack. On National Equal Pay Day, NUT-rition has teamed up with award-winning actress Laura Dern and Equal Rights Advocates (ERA) to shine a light on wage inequality. In the United States, women earn about 80 cents for every dollar earned by their male counterparts — and that’s just nuts. To raise awareness of the gender pay gap, NUT-rition partnered with Laura Dern as an executive producer of a hidden-camera video to highlight what it feels like to get less. In the video, unsuspecting store customers are sold gender-specific bags of NUT-rition – with male customers offered bags that have 20% less product than packs offered to their female counterparts. 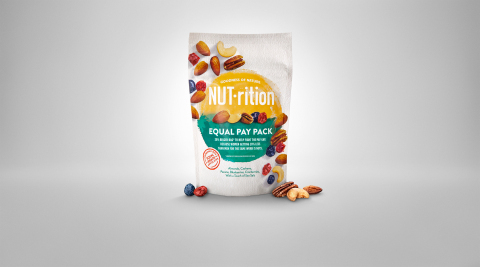 NUT-rition is also extending efforts from onscreen to on-shelf by launching a limited-edition Equal Pay Pack that is 20% bigger than the regular NUT-rition pack. The 20% more pack features a blend of almonds, cashews, pecans and dried fruit, and will be available for a limited time online at paygapisnuts.com and at select retailers. The Equal Pay Pack benefits Equal Rights Advocates and helps fund a legal helpline available to anyone who feels they’re experiencing an issue with pay inequality. "Women deserve equal pay for equal work,” said Noreen Farrell, Executive Director for Equal Rights Advocates. “We are proud to partner with NUT-rition to inspire workplace changes across the U.S. and to support women workers learning more about their rights." For more information about the gender pay gap and how you can enact change, visit equalrights.org. To learn more about NUT-rition and the limited-edition Equal Pay Pack, visit paygapisnuts.com and follow along on social media (Twitter.com/NUTritionSnacks, Facebook.com/NUTritionSnackNuts, Instagram.com/NUTritionSnackNuts).